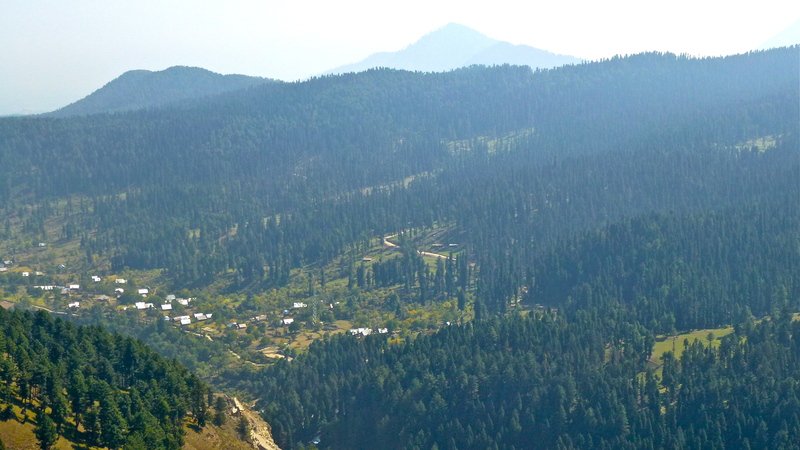 We drove towards the mountains on our way to Pahalgam. One mountain even had the remnants of last year’s snow on its peak so it’s very cold in winter! It rather surprised me, then, that our next stop was to be at a garden, ‘Poshwan Park’. And there it was – I’d found it – the sign said so – “Paradise on Earth”. I knew it had to be here in Kashmir somewhere! And what could be more of a ‘paradise’ on a day out in the country than to find a place that has ‘Toilet Facilities” . And this “Paradise on Earth’ was set in a stunning location. Its main feature was some strange topiary. On closer inspection, words, or at least, letters, had been ‘carved into the topiaried trees. It reminded me of a neighbour of ours who carves “Go the Brumbies” (his football team) into his hedge every winter – or at least in those winters when the Brumbies are winning!. The problem with this garden / park was that it did not seem to have a very strong design. 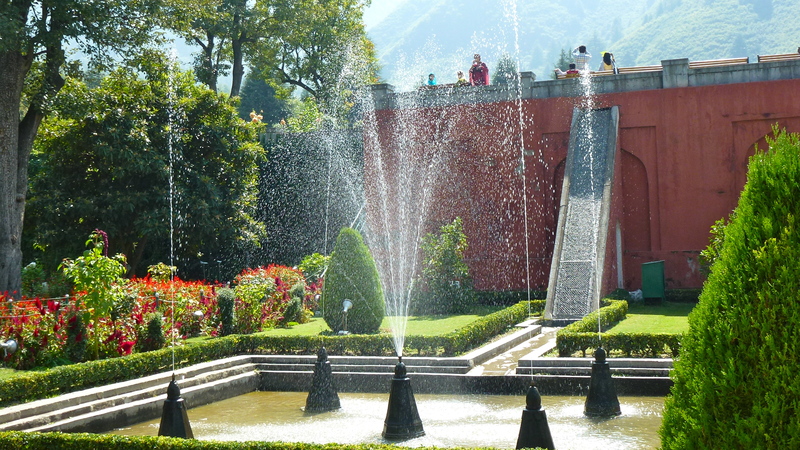 Unlike the Mughal Gardens of Srinagar, this garden was a bit like ‘Topsy what grew”. It was very difficult to photograph as there were no real focal points. But we’ll add a slideshow that will give you a feeling for the place – and it is in a delightful setting. 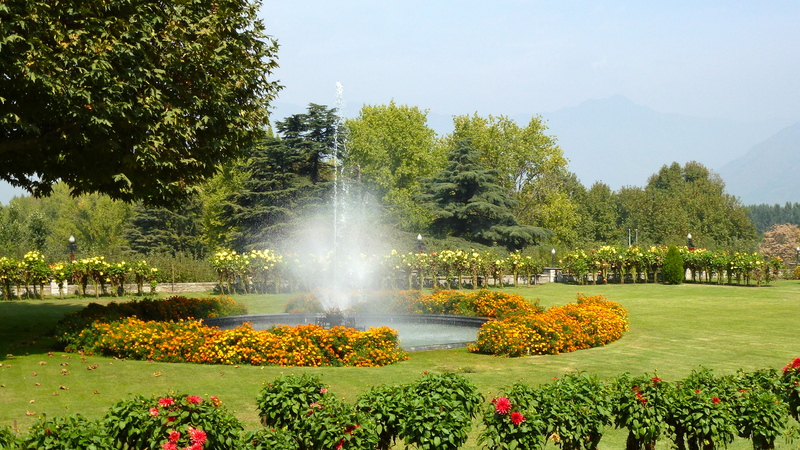 Leave a comment Posted in Kashmir Tagged "Poshwan Park", India, topiary"
Not far from Srinagar are the crocus farms that produce the famous Kashmiri saffron. We were in Kashmir just too early to see these fields glowing with the purple crocus blooms that produce the world’s most expensive spice. Crocus sativus – photo from a Kashmir saffron shop’s brochure. The special saffron crocus, Crocus sativus, is grown from corms as the plants are sterile and don’t produce seeds. The saffron is derived from the flower but the only parts of the flower that are used are the three central, long, reddish -orange threads, the stigma. Each crocus corm only produces two to nine flowers per season and it takes 150,000 flowers to produce just one kilogram of dried saffron. No wonder pure saffron is so expensive. 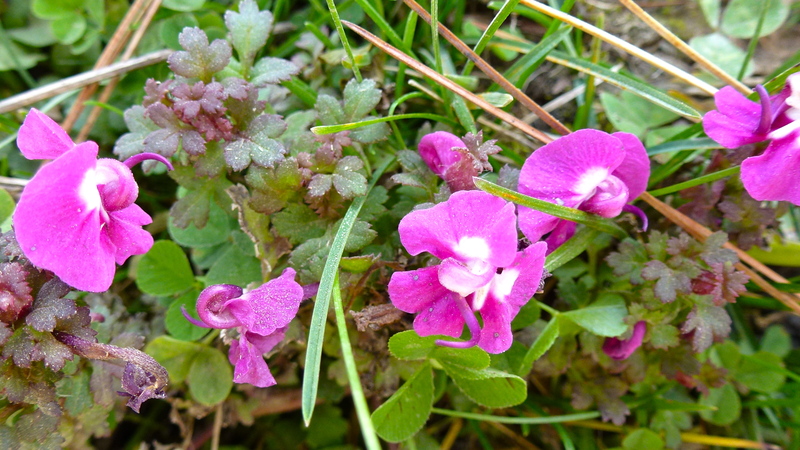 The stigma are hand harvested in the Autumn during the short flowering season. After the flowers are picked , they are taken to the sorting tables. There, the stigma threads are carefully plucked by hand from the flowers. When harvest is over and the plant dies back, the corms are divided ready for re-planting. 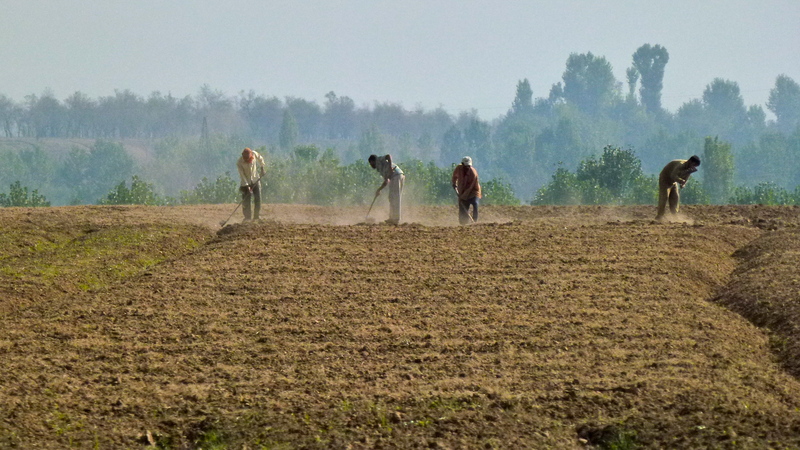 Saffron farming is very labour intensive. Saffron grown in Kashmir is deep in colour and flavour and is not often available for export as it’s mainly all sold domestically in India to flavour and colour foods. 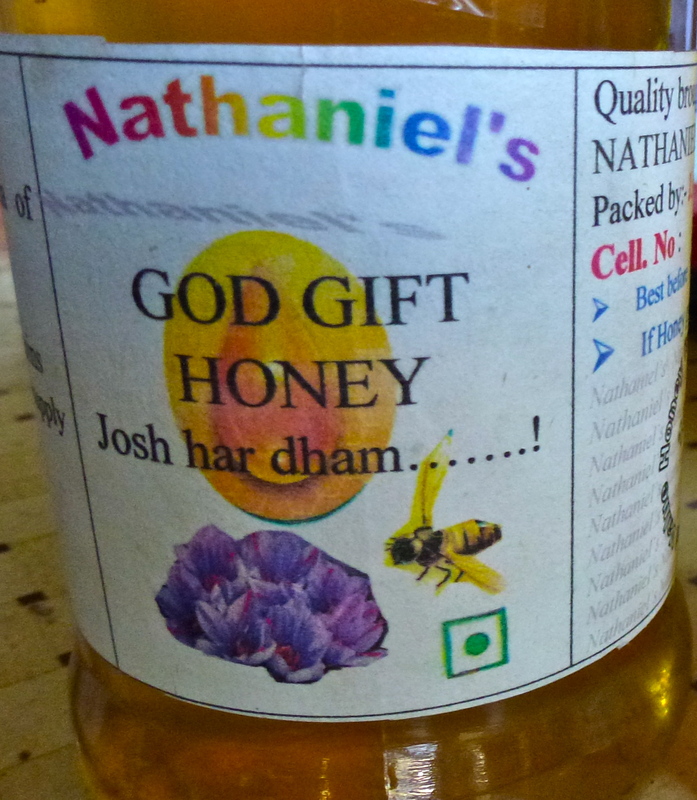 Saffron Honey was one of the delicacies sold in the Saffron shop. For at least three thousand years or more, saffron has been used as a seasoning for food, as a fragrance, as a textile dye and as a medicine. 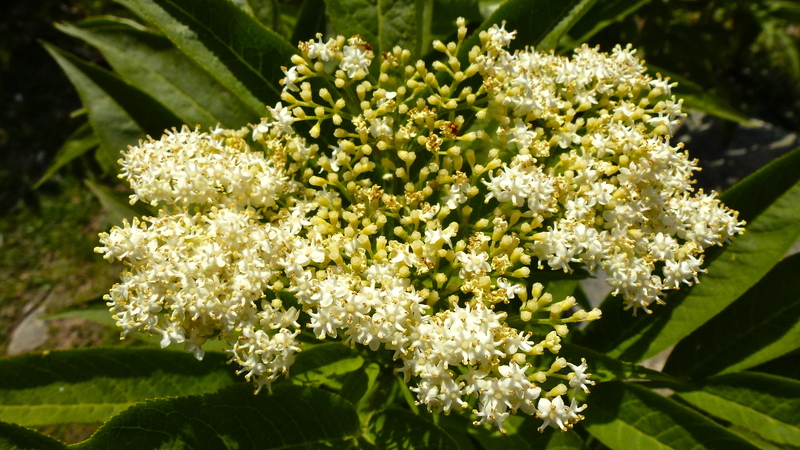 It was probably first cultivated in Greece but it has been grown and used for millennia in Africa, Asia, and Europe. It’s now used in countries all over the world. Today, over 90% of the world’s saffron is grown is Iran although some is still grown on original farms in Spain. A few of the new breed of organic farmers are now adding it to their hand cultivated herbs and spices in New Zealand, Tasmania and California but it is very labour intensive and thus extremely expensive. Saffron is used in a wide variety of cuisines and there are recipes for many of these dishes on the internet. Steep the threads in hot water or broth for 15 minutes to 4 hours to extract the flavour before adding with the liquid ingredients to a dish. If steeping the threads in alcohol for a recipe, the alcohol does not need to be hot. Toast the threads for 30 seconds in a dry pan or for 30 seconds in a microwave on high before crushing them between two spoons to add to dry ingredients. The taste is bittersweet and sharp so only very small amounts are required. Be careful about buying pre-powdered saffron because it may have been diluted by the addition of other yellow ingredients such as safflower, turmeric or marigold. These will not add the same colour and flavour as pure saffron. Powdered saffron has a short shelf life. Store saffron in a dark place in an airtight container. 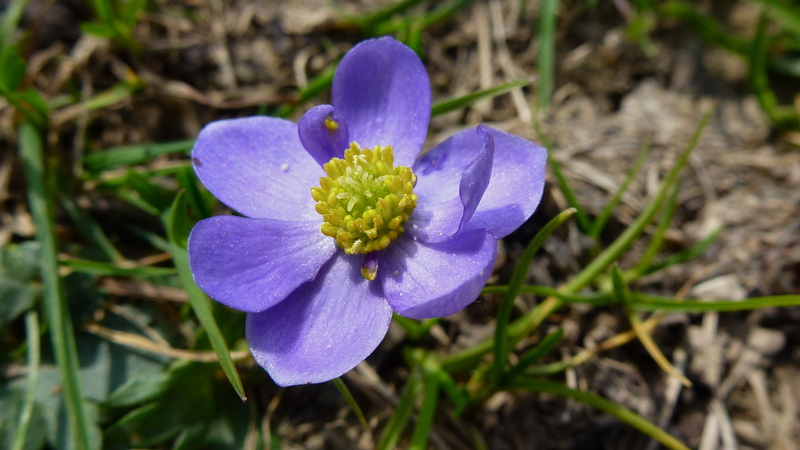 Do NOT try to use autumn crocus (Colchium autumnale) as a substitute – it is poisonous. So when using saffron to enhance our food, let us remember the men and women who produced those tiny threads of saffron – by hand – over many hours of dedicated labour from cultivating, planting and weeding to picking, plucking and packing the threads. 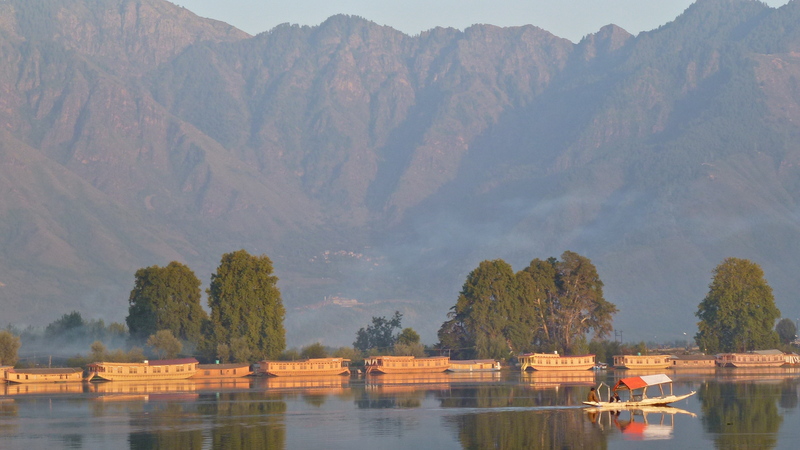 The sun shone in Srinagar as we set out to visit the famous Mughal Gardens which would give us an insight into the world of the Mughal Emperors who reigned in India from the early 15th century to the early 18th century. Back in those days, when the summer weather in Delhi became too unbearably hot, the Emperors and their entourage would ride on elephants over the baking hot northern plains and up over the mountain passes to the relative cool and peace of the beautiful Kashmir Valley. Here, in the shadows of the lower Himalaya, they established their pleasure gardens. 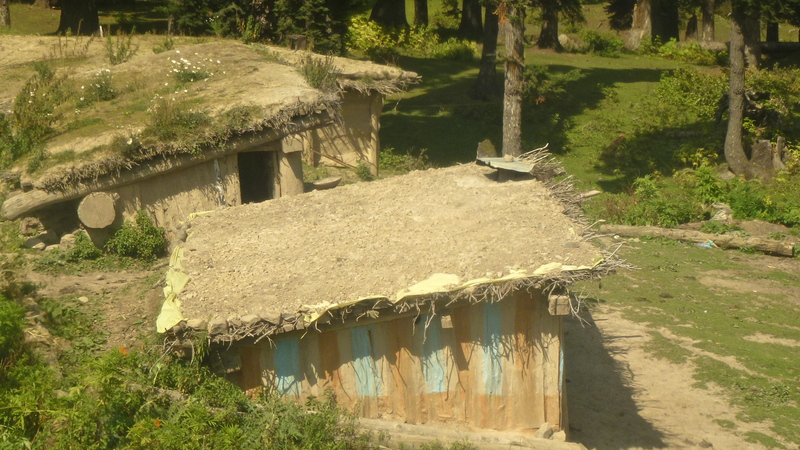 These have now been restored and were one of the highlights of our time in Kashmir. 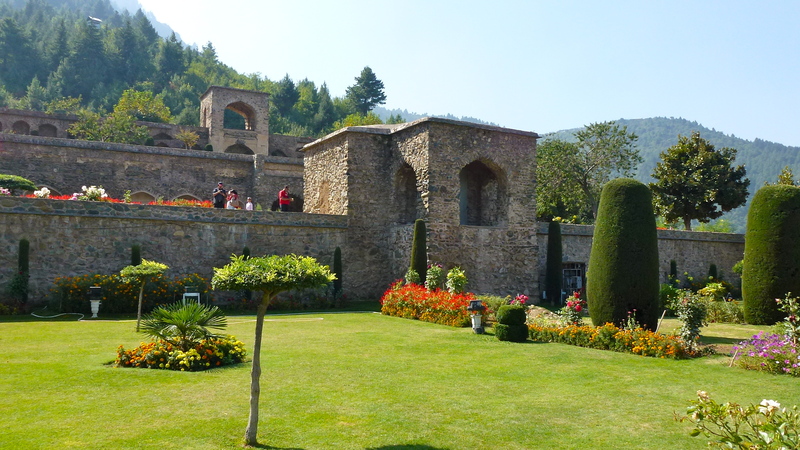 The first Mughal garden we visited was the Pari Mahal garden, located on the Zebanwan Mountain, 5 km west of the center of Srinagar. It consists of six terraces aligned roughly north-south, with arched retaining walls supporting the terraces against the mountain. 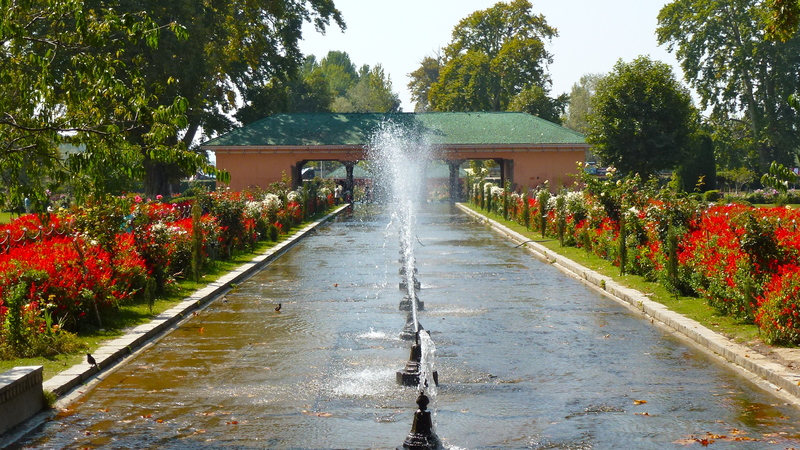 Unlike other Mughal gardens in Kashmir, this garden has no water cascades or ‘chadars’ – ramps that transfer water from one terrace to another. Pari Mahal was built in the mid-seventeenth century on the ruins of a Buddhist monastery by Prince Dara Shikoh, the eldest son of Shah Jahan (the Emperor of Taj Mahal fame). The buildings in this garden were used as an observatory for the teaching of astrology and astronomy. 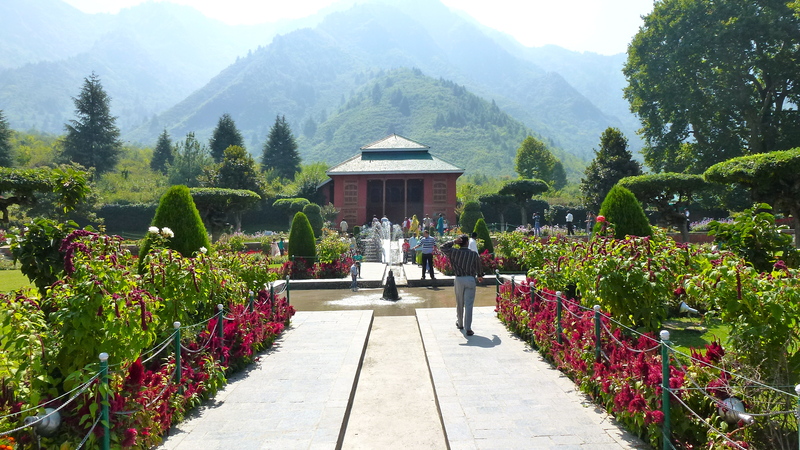 After coming down from the mountain, we visited the largest and most famous of the Mughal gardens of Srinagar, Shalimar Bagh. 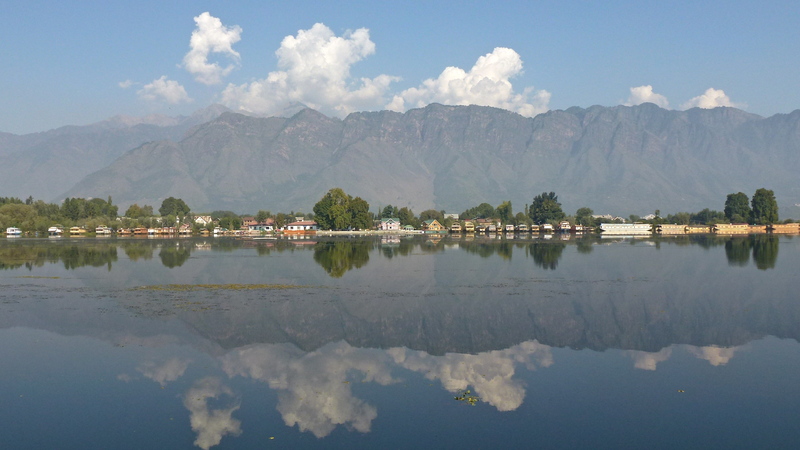 Since the second century there has been a garden here on the northeast shore of Dal Lake. The revamping of this ancient garden was the dream project in 1619 of Emperor Jahangir who wanted to please his queen Nur Jahan. Although Emperor Jahangir had married many times to girls from very high-class noble families of the Mughals and Rajputs, a Rajput princess known as Jagat Gosain was said to have been his favourite. She was the mother of Shah Jahan, Jahangir’s successor. But Jahangir was also attracted to the ‘unparalleled beauty and intelligence’ of Nur (or Noor) Jahan. 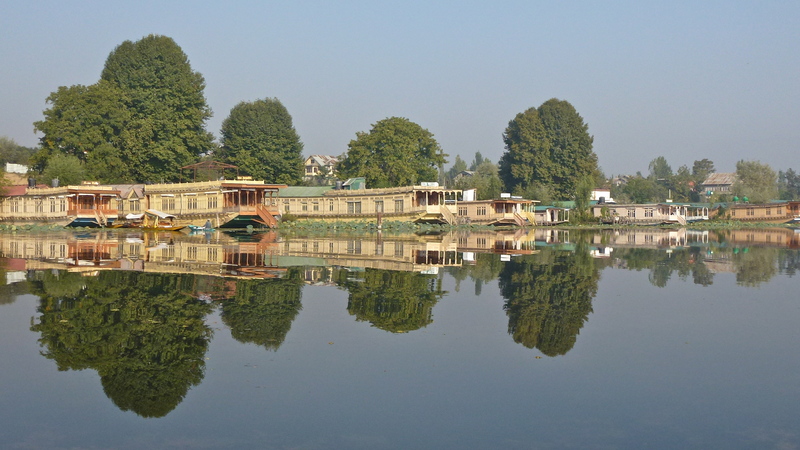 He married her as well and she was the reason he wanted his Shalimar Bagh in Srinagar to be perfect. The rebuilding of this ancient garden sat well with Jahangir’s interest in fine arts, poetry, paintings, dance and music. He was also a good writer and loved nature. In 1630, Emperor Shah Jahan, Jahangir’s son, had extensions added to the garden. Today, 380 years later, this garden is considered the high point of Mughal horticulture. Beautiful ‘Shalimar Bagh’ – © JT of ‘jtdytravels’. The layout of this beautiful garden is an adaptation of the ancient Persian gardens which were built on a square plan with four arms radiating from a central location. This design couldn’t be exactly replicated in the hilly conditions in the Kashmir valley. So the design was modified to suit the terrain and the availability of water which was diverted from a higher elevation and runs by gravity down along the main channel that runs through the terraces of this rectangular garden. 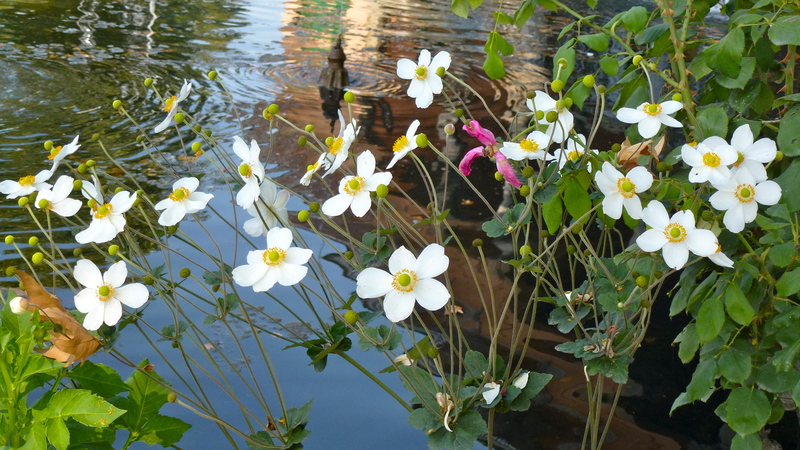 Colourful flower beds beside the water follow the line of the vistas and add that extra dimension to delight visitors. There are many fountains and pavilions in this garden of 12.4 hectares. It’s 587 metres long and 251 meters wide. 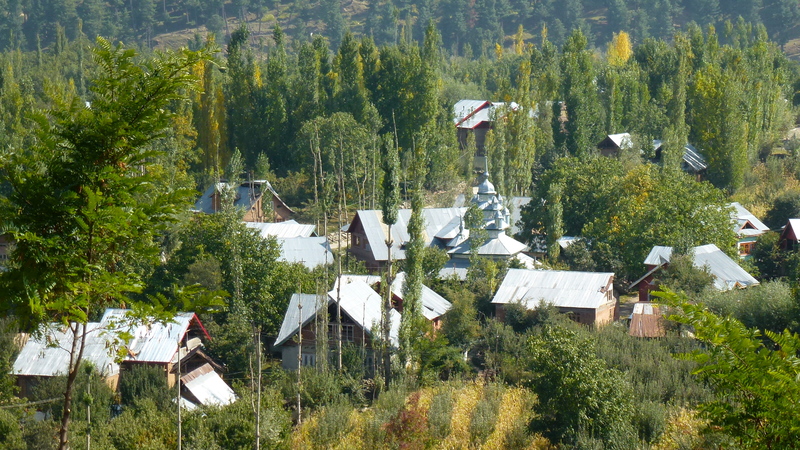 The terraces are lined with mature chinar trees (Plantanus orientalis), which create magnificent leafy vistas. Many of these trees were in fact planted by Shah Jahan during the early decades of the 17th Century. But Shah Jahan did not stop garden design and building after completing Shalimar Bagh. In 1632, he began to build Chesma Shahi, the smallest of the Srinagar Mughal gardens. It’s known as ‘Royal Spring’ due to the mineral-rich spring water that feeds the water courses. The source of this water emerges within a pavilion at the top of the garden. Many visitors to these gardens believe in the healing properties of this water and come here to the source to drink. 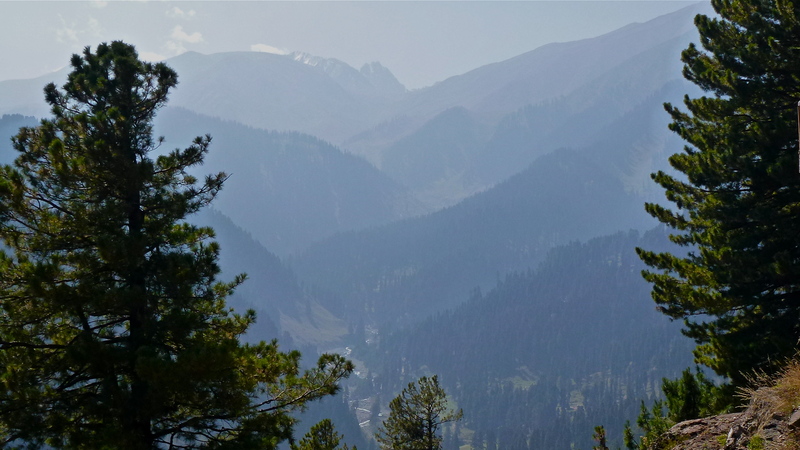 This much steeper site is at an elevation that affords grand views back to the mountains as well as out over the Srinagar valley and its lakes. Chinar trees feature predominately here as do various conifers and other trees which are suited to the climate: hot and humid during the summer and snowy cold during the winter months. Colourful flower beds along the water courses and out in the surrounding lawns again delight the visitor. Because this garden is built on a hill, some very steep flights of steps need to be climbed from one terrace to the next. At one point, a water ‘rill’ tumbles down beside the steps taking the water into a pool of fountains – a nice place to rest. It seems that there was plenty of work for the horticultural trades in those times, or otherwise, prisoners and slaves from defeated armies were ‘gainfully’ employed for in 1633 a fourth Mughal garden was built in Srinagar. Known as Nishat Bagh, or ‘Garden of Joy‘, it was designed and built by Asif Khan the father-in-law and Prime Minister of Shah Jahan. As with Shalimar, a rectangular design was employed with the central axis being 548m in length. (Asif wasn’t silly enough to make his garden bigger than his Emperor’s) There are twelve terraces, each terrace representing a Zodiac sign. The cascades between each terrace and the numerous fountains create sound as the water falls. The water sparkles when the sun shines. 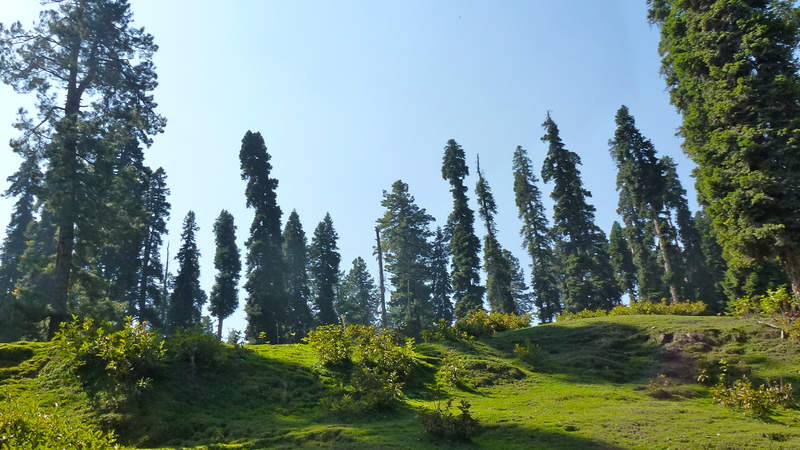 Chinar and cypress trees again dominate the landscape. But this was not always a ‘garden of joy’! When Shah Jahan saw his father-in-law’s completed ‘Garden of Joy’, he was most impressed – and he said so. He hoped that Asif would give him the garden. But, when Asif didn’t take the hint, Shah Jahan was so piqued that he ordered the shutdown of the garden’s water supply, the Gobi Thirst, a natural spring which produces clean, clear water. Asif was beside himself with grief as his garden began to die for lack of water. He became depressed. One day, however, so the story goes, whilst sitting under a tree in this garden, Asif heard the sound of running water. When he realised that one of his gardeners had turned the water back on, Asif was mortified. He feared the wrath of his son-in-law and immediately ordered the water to be turned off again. However when Shah Jahan heard of the incident, rather than being upset, he rewarded the loyal servant for standing by his master. He allowed the flow of water to be restored. 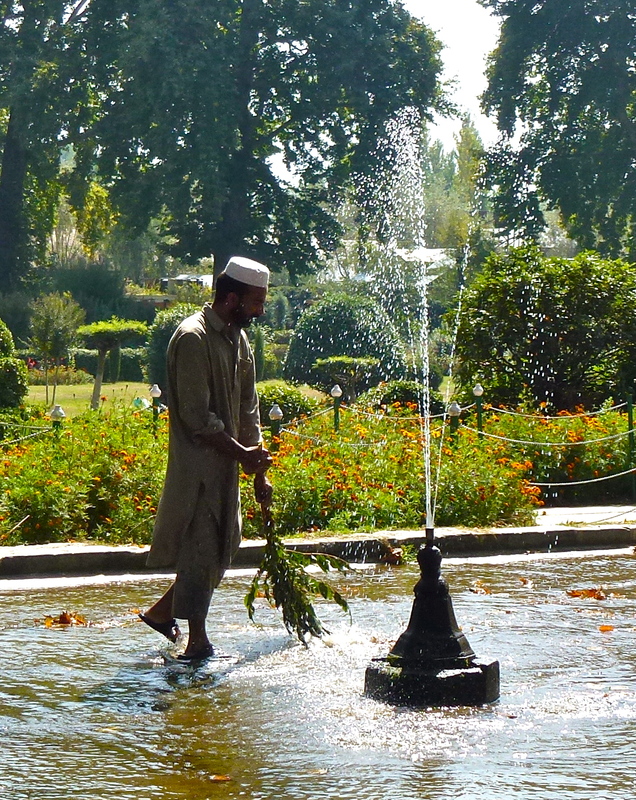 Wandering through the Mughal Gardens of Srinagar was indeed a highlight of our time in the Kashmir. 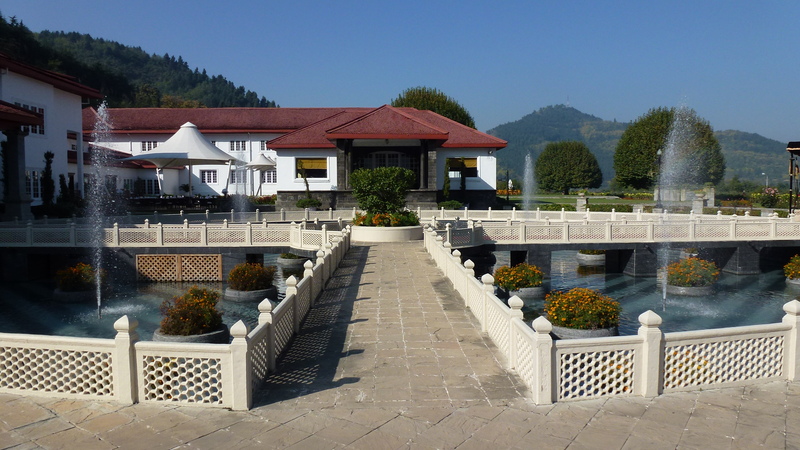 But, as always, after a day out exploring in the town, on the lakes or in the countryside of Kashmir, it was always a delight to return to the peaceful garden of our Lalit Palace Hotel. 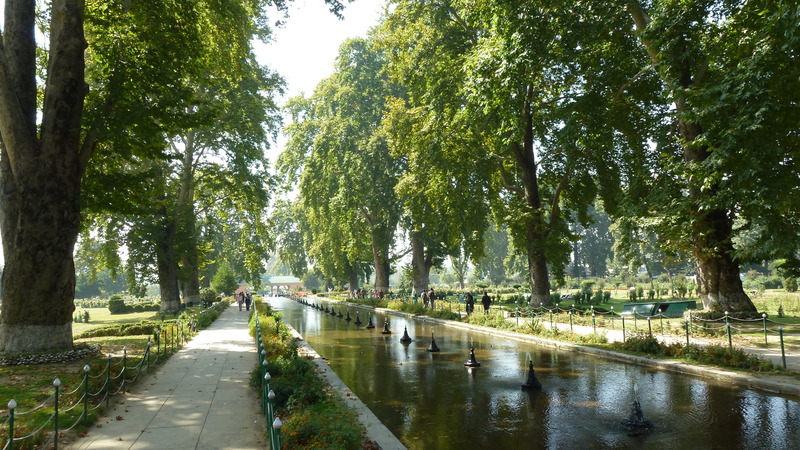 This garden, too, was designed somewhat along Mughal garden principles with pools and fountains, wonderful old chinar trees and long vistas of flower beds… but it lacks the water courses. My first foray out into the countryside was a drive of 90km to the major ski area of Gulmarg high in the mountains above Srinagar. 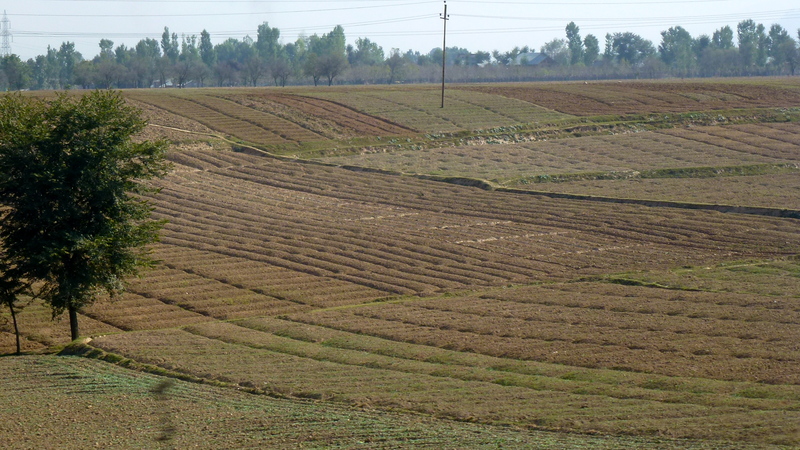 We travelled through the freshly harvested rice paddies of the Kashmir Valley until they gave way to nut groves and apple orchards. These in turn were replaced by forests of magnificent pines and firs as we gained ever more altitude. 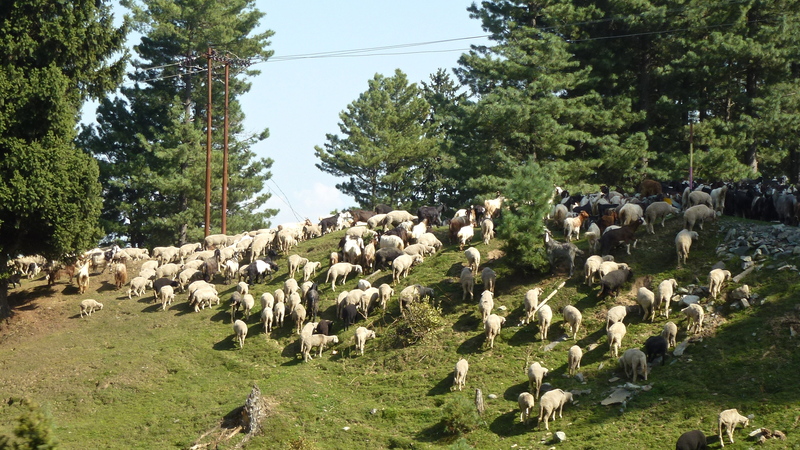 At times our way was blocked by herds of goats which graze on the slopes. 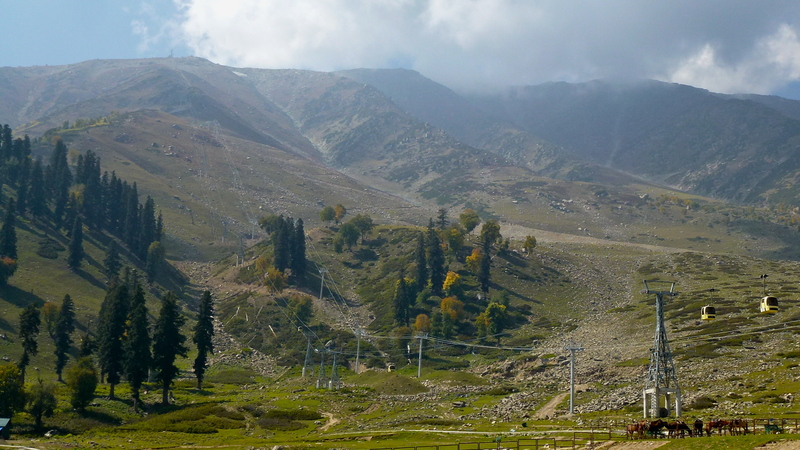 As we drove ever higher, I was looking forward to getting to Gulmarg to experience the much vaunted “Valley of Flowers”. 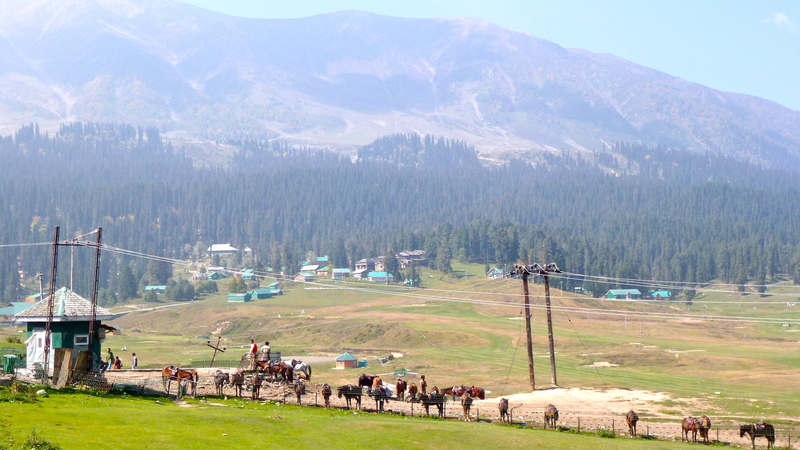 Originally called ‘Gaurimarg’ by shepherds, the present name of Gulmarg was given in the 16th century by Sultan Yusuf Shah, who was inspired by the sight of its grassy slopes emblazoned with wild flowers. This was a favourite haunt of Emperor Jehangir who once collected 21 different varieties of flowers from here. But to my amazement, the Valley of Flowers’ has gone; completely gone. In it’s place is a golf course without a tree or shrub, let alone flowers. Maybe in spring there are a few flowers around the edges, if the horses haven’t eaten them. Hardly a thing raised its head to greet me during my visit. There weren’t even any golfers! 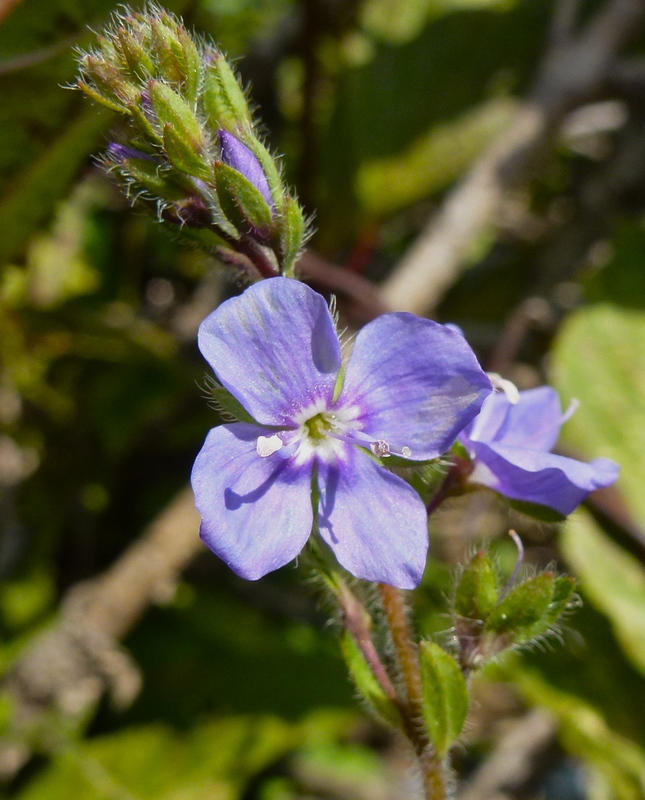 As I walked around the edges of the course, I did find this one small flowering plant – but not a field of flowers! 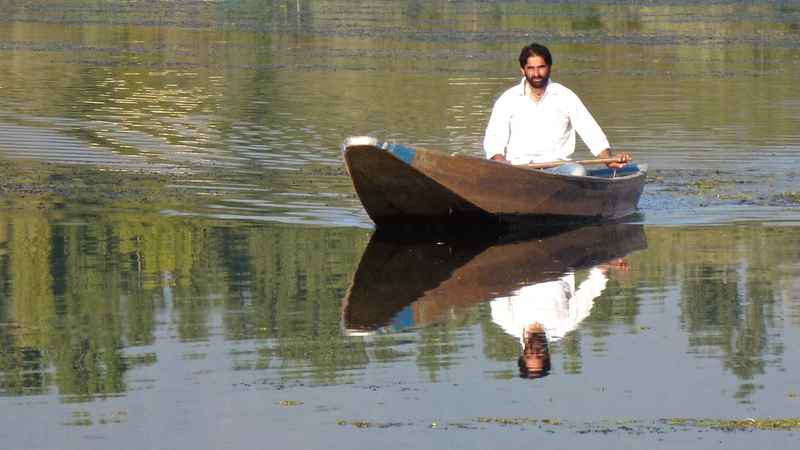 My longed for flowers were now just the stuff of a past Kashmiri legend. 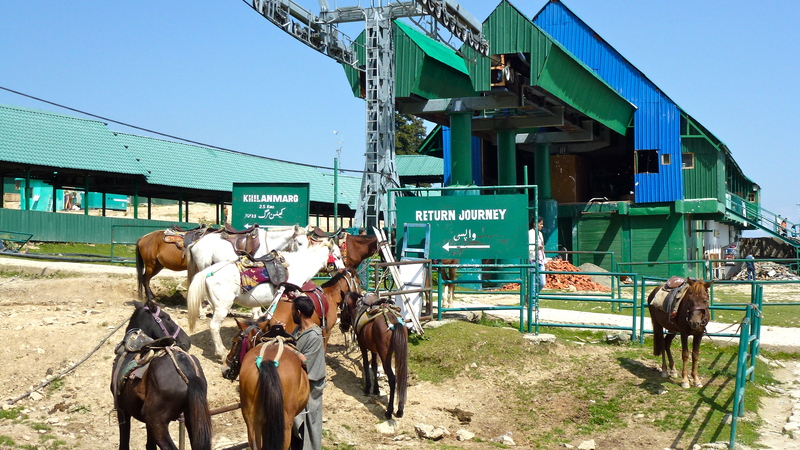 To get up the first section of mountain there was a choice – ride a pony or take the fairly new gondola which climbs to 3045m and is said to be the longest and highest cable car in Asia. I took the easy option, the gondola just to see what there was to see. The whole area is called a National Park but people still live in it and it is heavily grazed by cattle, ponies, goats and sheep. By the time I got to the top gondola station, I was glad that I hadn’t ridden a horse! It was a long way for someone, like me, who is no way a horse rider. 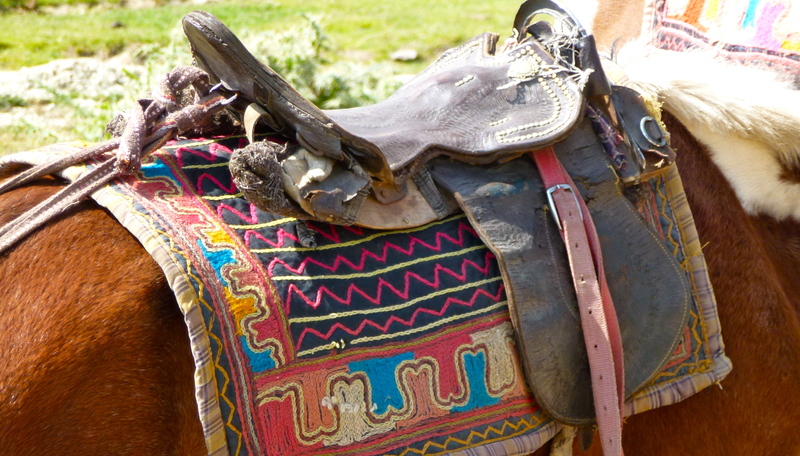 The horse blankets are made using the traditional Kashmiri rug chain stitch embroidery. 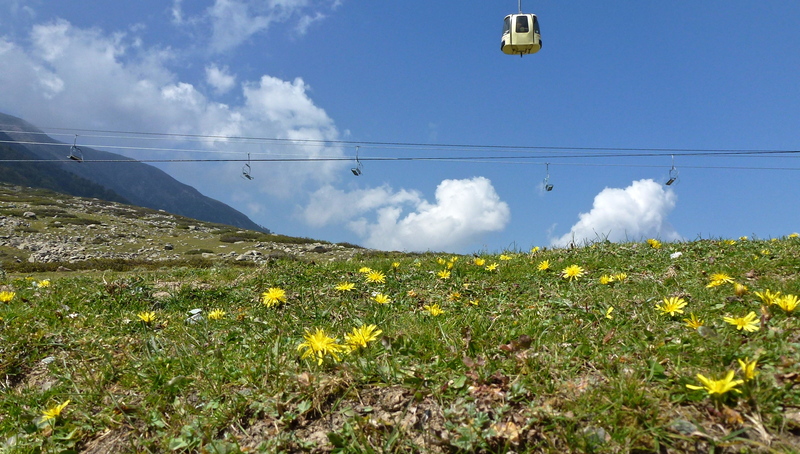 Another gondola and a ski chair lift went further up the mountain beyond the tree line but I stayed at this level to search for whatever wildflowers I could find. The ubiquitous dandelion was the most prevalent flower on these rocky, high places. 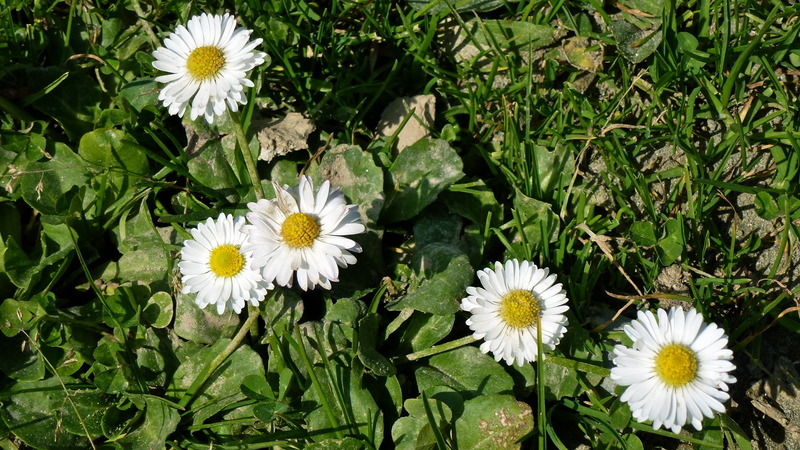 Common ground hugging daisies also seem to survive almost anywhere. I walked; I looked; but only the odd plant survived in these conditions to flower at this time of the year. I did find an Anemone obtusiloba. It is said that the juice of this plant’s roots can be used as an opthalmic (eye) medicine. 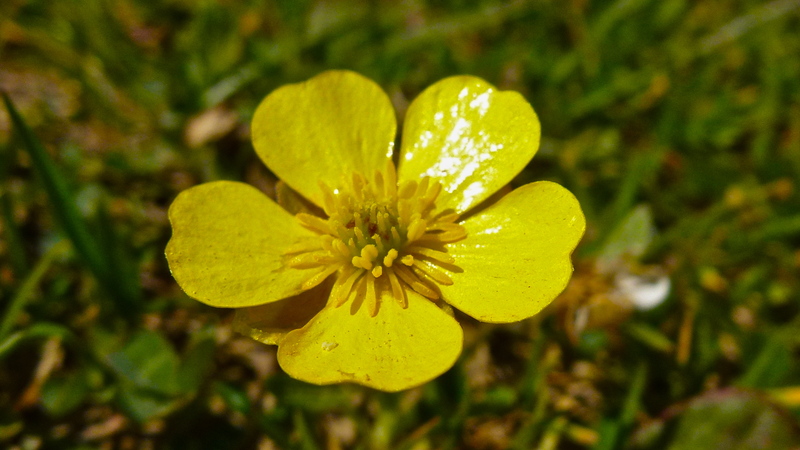 Cheerful, sunny Buttercups (Ranunculus sp.) are always a pleasure to find. The young shoots and leaves of this Elderberry (Sambucus adnata) are cooked and eaten as a vegetable. 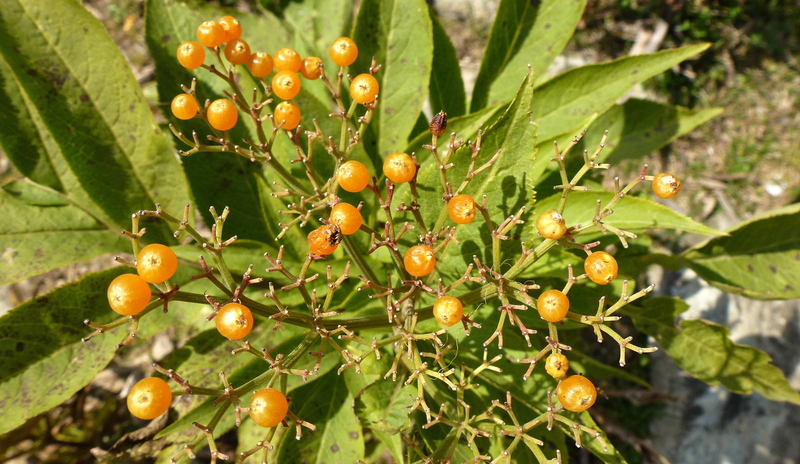 The ripe yellow berries of the Elderberry are eaten as fruit. As often happens, when I do find a flowering plant in an unfamiliar place, I don’t know it’s name! This flower is tiny but such a beauty. It’s always worth taking a good look at small things in nature. On the way back towards Srinagar, the views down into the valley were spectacular, if a bit misty. 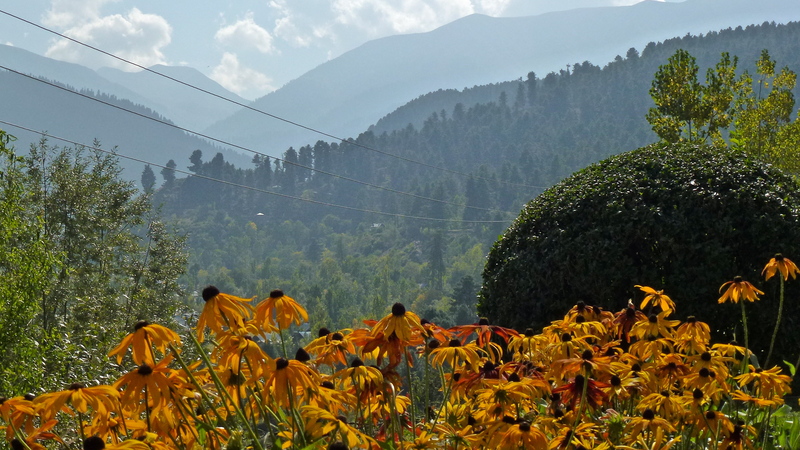 Garden escapees like these Rudbeckia added interest and colour to the view. 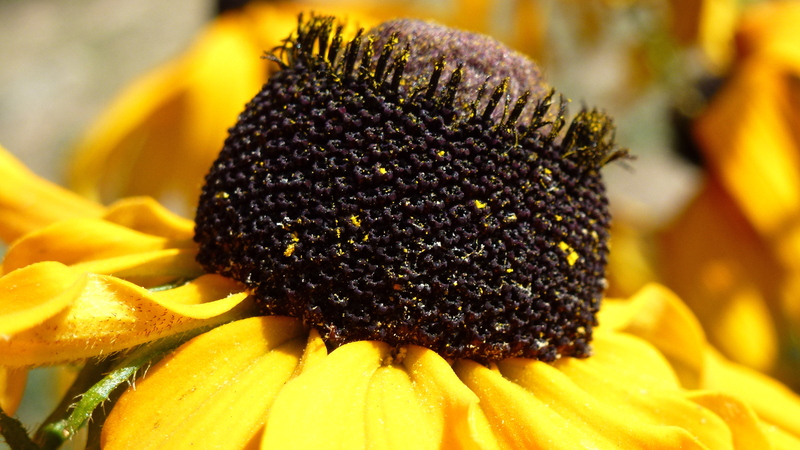 This photo explains Rudbeckia’s common name of Cone Flower. 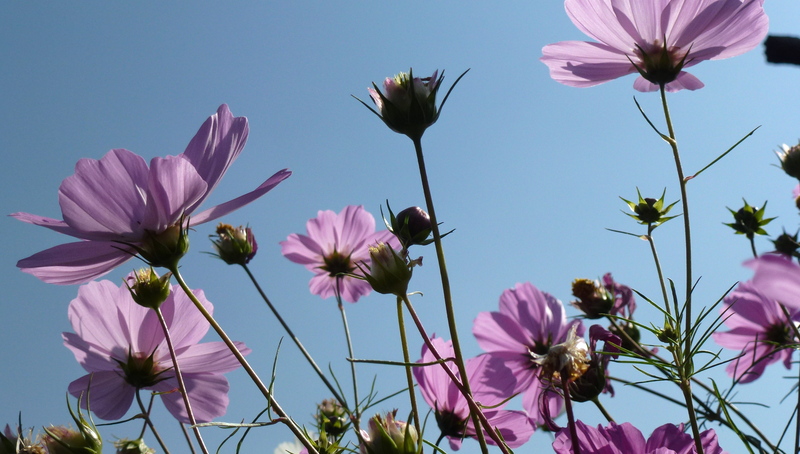 Another very photogenic garden escapee adorning our roadside stop was this Cosmos. This Marigold was another humble garden escapee. It’s grown all over India to make Puja Garlands. “Medicinal uses : Marigold is used for stomach upset, ulcers, menstrual period problems, eye infections, inflammations, and for wound healing. It is antiseptic. 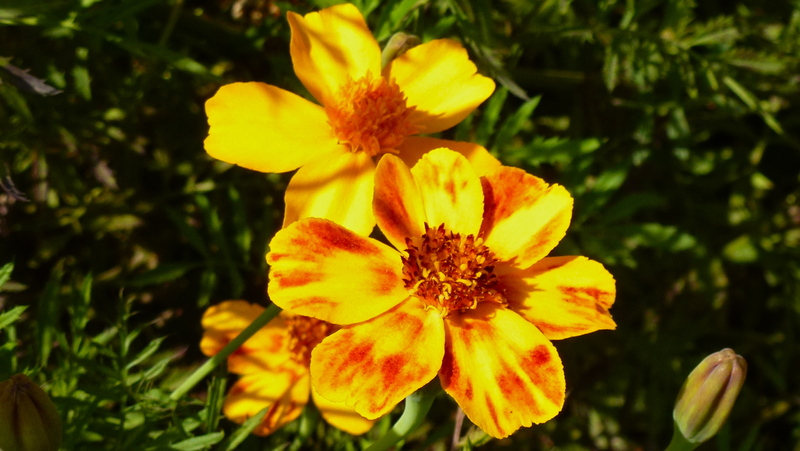 If the Marigold flower is rubbed on the affected part, it brings relief in pain and swelling caused by a wasp or bee. A lotion made from the flowers is most useful for sprains and wounds and a water distilled from them is good the sore eyes. The infusion of the freshly gathered flowers is beneficial in fever. Marigold flowers are mostly in demand foe children ailment. Externally it is used in the treatment of alopecia. Internally it is used to treat bladder and kidney problems, blood in the urine, uterine bleeding and many more. So maybe the marigold is not so humble after all! 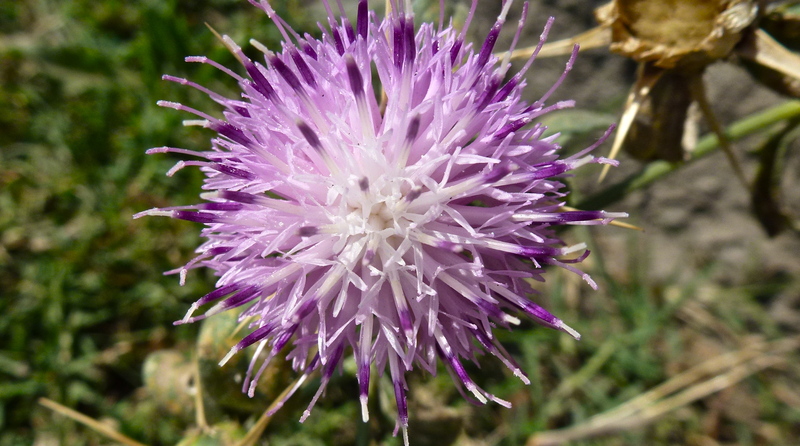 I have absolutely no idea what this purple/mauve pom pom is – but it is delightful! I suspect that those garden escapees had come from this small village just below our road side stop. In late afternoon, the broad panorama of the valley with its braided river came back into view. It had been an interesting day but, with my expectations of finding the much reported fields of wild flowers, I was disappointed. 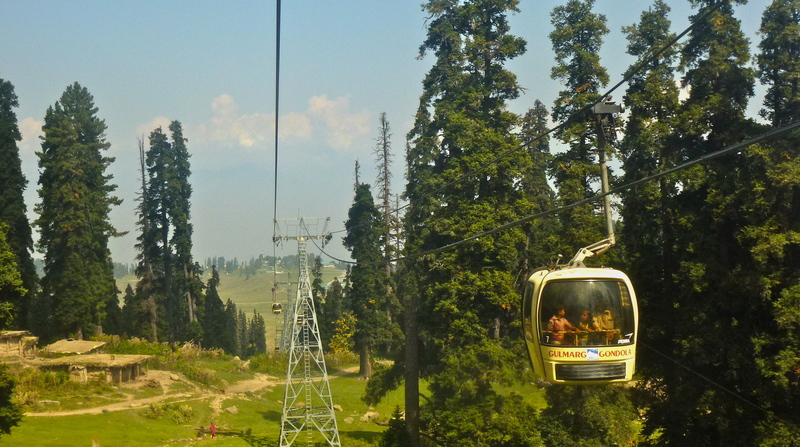 Gulmarg has a history of being a pleasure resort for kings and their families. It was also the summer retreat for officers during the British rule in India. These days it is mainly a ski resort and I can imagine it is spectacular with the mountains covered in winter’s snow – but in autumn it is not at its best. 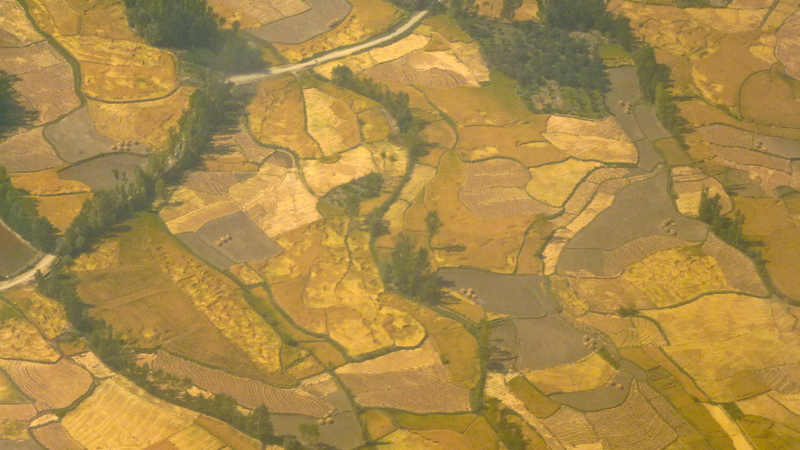 It was October, harvest time in Kashmir and we had seen the golden fields and hay stacks from the air. 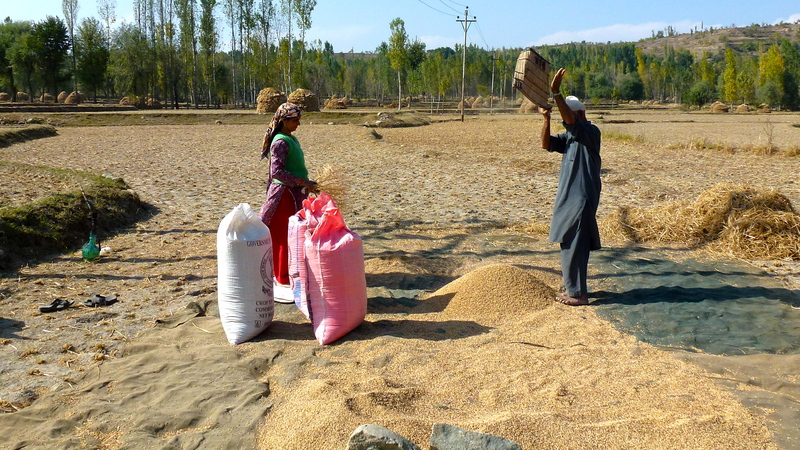 We had read that 80% of the population of the Kashmir Valley are engaged either in agriculture or in occupations allied to farming. 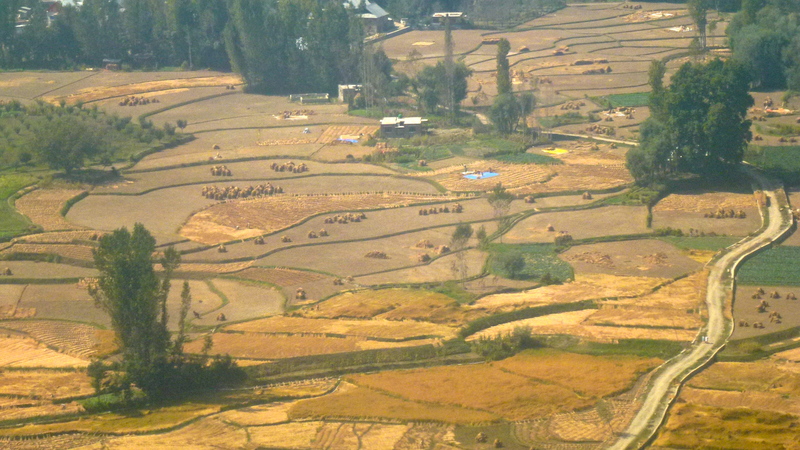 Indeed, the valley seemed to be a patchwork of small fields and villages. Driving through those farms brought the life of the farming families to a much more personal level. 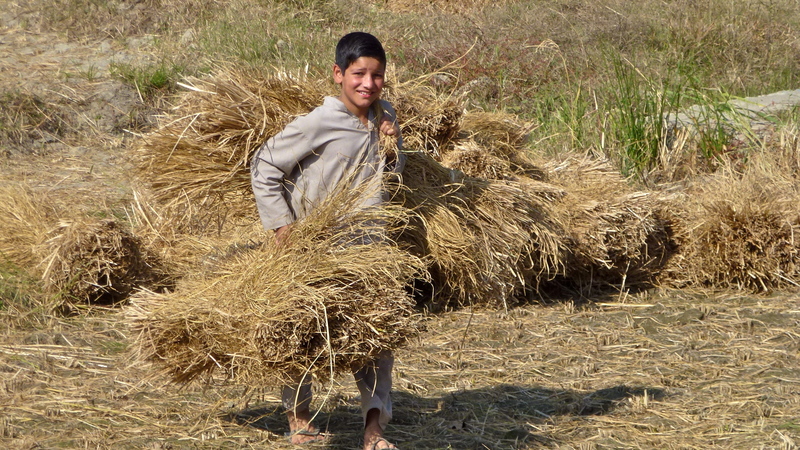 All the family helps in the process of harvesting and threshing their crops… by hand. 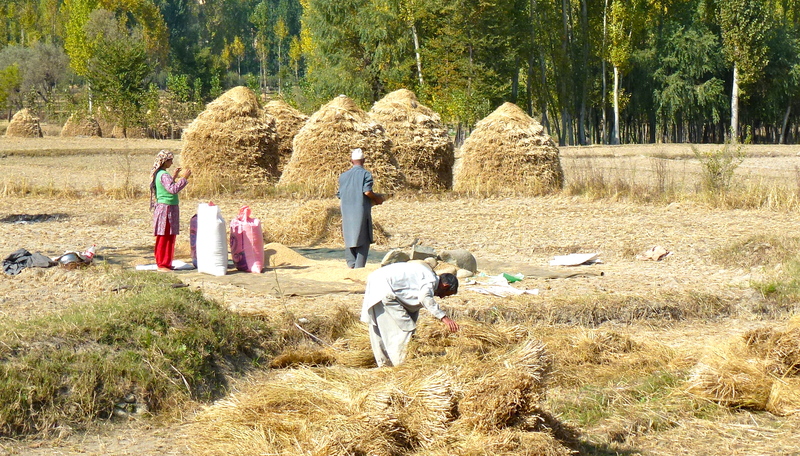 The major crops of the Kashmir Valley include rice, maize, pulses, oilseed, fodder, wheat and vegetables. 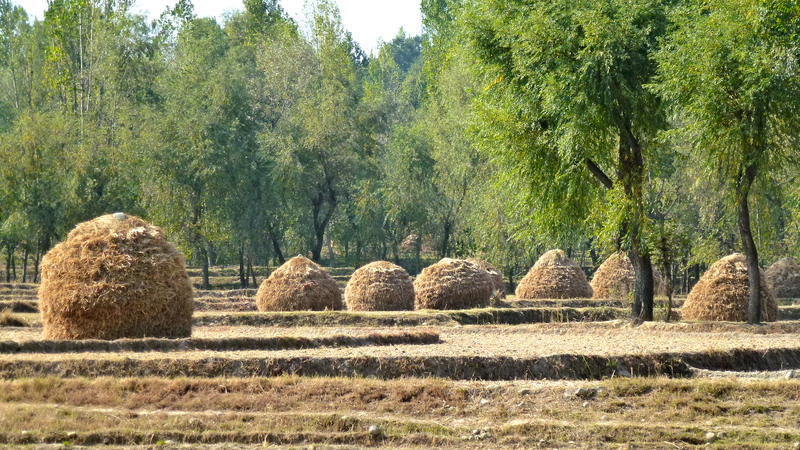 Rice was being harvested and threshed in these fields. Even the children get involved and help out at harvest time. 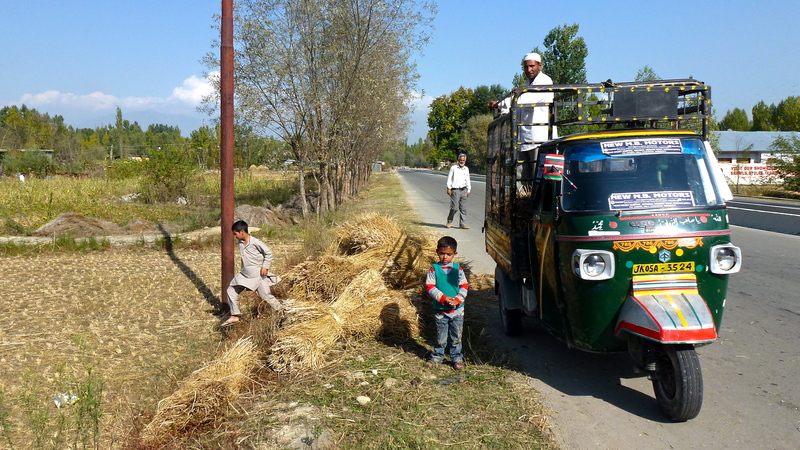 Apart from horse and cart, one of the enduring forms of farm transport is the tuk tuk. Although the Department of Agriculture endeavours to introduce new technologies of modern farming and new ways of developing commercial agricultural activities, farming in this valley still involves back breaking labour and threshing by hand with all family members involved. Nagin Lake looked absolutely stunning in the morning light – perfectly still with perfect reflections. I did not look forward to leaving this idyllic location to go on the long, all day drive to Gulmarg with D and Mr B. That, I reasoned, would have involved a lot of loud talking by Mr B., a long and bumpy road trip, a rather long walk or a horse ride and a ride up a gondola that would go too high for me to be able to breathe properly. And who knew where the ‘loo’ stops would be. That important part of daily planning did not seem to be on Mr B’s list of considerations at all. So I wisely decided to stay on the boat and enjoy the beauty that was right there, all around me. I had the houseboat to myself on a glorious sunny morning; life was indeed good. Not only was the view delightful but there were lots of birds to watch. 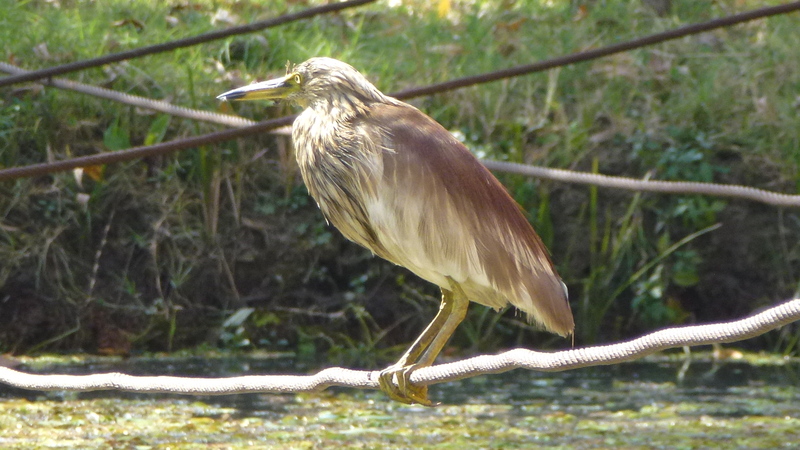 A lone heron kept me company. He stood on one of the mooring ropes, quietly gazing at the view, just as I was doing. A magnificent eagle, its call like that of a ‘whistling kite’, soared backwards and forwards across the water in front of the house boat. At times he seemed to be moving and gliding in perfect time with the Mozart piano concerto that I was enjoying through my headphones. 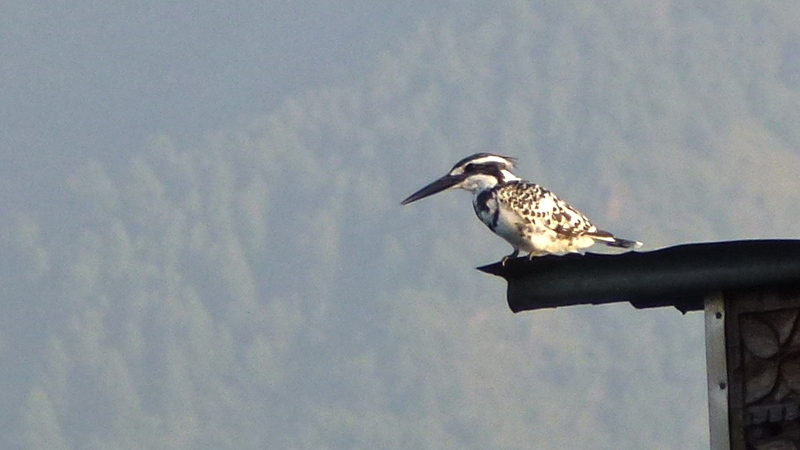 A black and white kingfisher fished from a perch on the next houseboat. It flew high above the water, flapped its wings at a great rate as it hovered before darting straight down into the water for its catch. 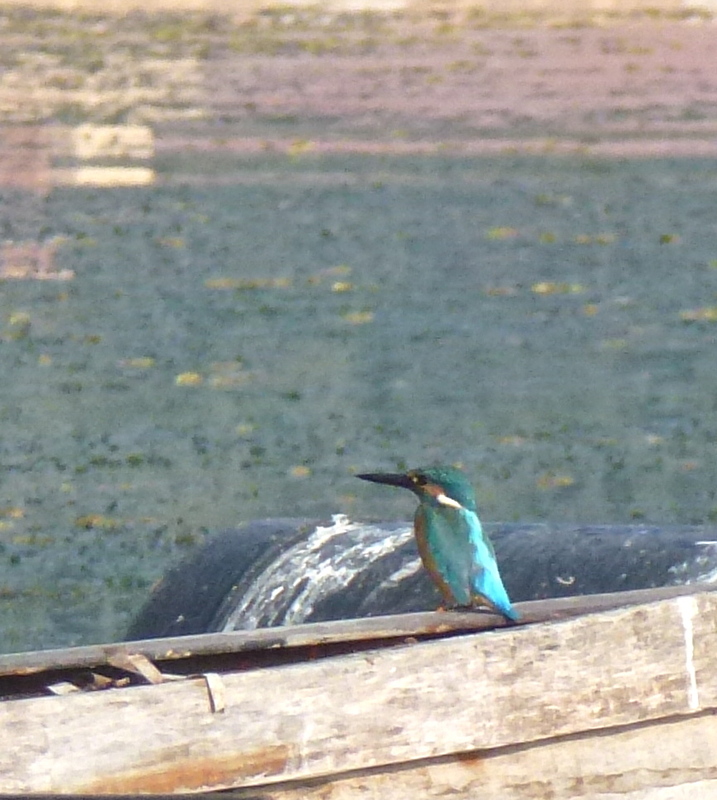 A tiny bright blue kingfisher darted back and forth as it skimmed the water for food. A large group of pigeons cooed from the roof of the next houseboat. Small ducks dabbled happily in the weeds that are beginning to choke the lake front. And of course there were a few hawkers that I had to dissuade from trying to sell me their wares. And out on the lake there were a few ‘shikaras’, perfectly reflected in the still waters. That was my morning. Perfect. And it seemed that it was perfect for others, too. One or two shikaras glided over the water – and the guests on board seemed to be very relaxed. This local was off to do a spot of fishing – but he was not in a hurry. Nothing was moving – the reflections were perfect. The sun was warm; the whole scene was soporific; I began to nod off to sleep. I had not had a good night’s sleep. This was catch up time. Not long after we had gone to bed, the mosquitoes flew in – and they would not be caught! Then, during the night, the light that we had left on in the ‘loo’ area had gone off and not long after that so did all the electricity… and all the outside security lights. It was very, very dark which is not a problem until nature calls and a visit to the ‘loo’ becomes essential. Now going to the loo in the middle of a very dark night in a strange place is always a bit of an obstacle course, but this adventure included a couple of steps. Groping in the dark, I finally found the loo and on lowering myself, as we women have to do, I discovered that the loo seat was no longer attached to anything. It slid around all over the place and ‘bit my bum’- not nice when your need is by now urgent! Getting back to bed was another ‘bumping into things’ adventure. And just when I finally got to sleep, the dawn ‘call to prayer’ began – very loud and very long. I know. I know – I was in India. One expects these things. It’s how it is. Both loos and electricity are interesting facets of houseboat living. Electricity seemed to be ‘stolen’ from the mains power by many of the houseboats. How? Simple really! One end of a stiff, plastic coated, copper wire is bared and then bent into a hook. This is thrown at the live wire and, when it hooks, hey presto, the house boat has electricity! Of course this isn’t done in front of guests but the evidence is there for all to see. When an inspector comes lurking, the wire is unhooked and hey presto, the lights go out! No more electricity. We also discovered to our dismay that the loos were not connected to anything at all – except the lake beneath the boat! We wondered what the e.coli count would be – off the scale perhaps! I was wakened from my nap for lunch by Majid who had made me a sandwich and yet another cup of tea. As we sat and chatted for awhile, I realised that the house boat lounge where he slept with its carved tables and chairs and tapestries on the wall was a far cry from the home he had left behind in his small hill village, 100 kms away. He returns home for only four days a month. He’s working on the houseboat to support his wife and three small children as well as his sick brother and his wife and their two children. The family all live together in one small house in a village of about 500 people. The two women grow some vegetables and a little rice for the family’s food. It’s real subsistence, survival living. 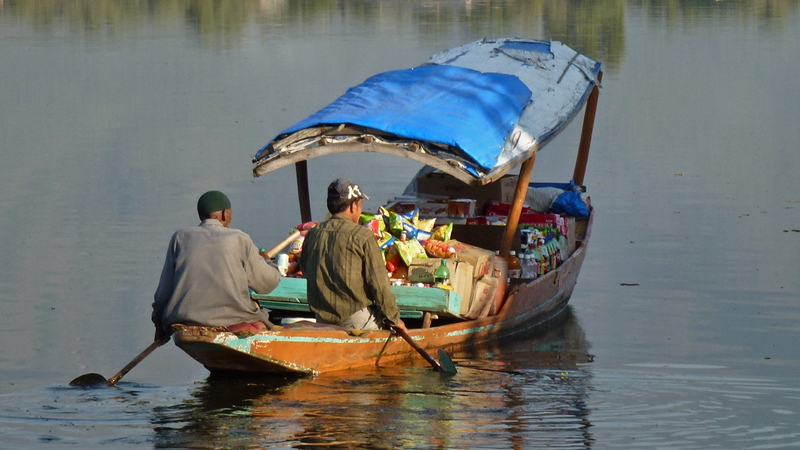 As we talked, the local grocery shikara came by. Majid told me that these men live on their craft – it’s their way of life. And then, as we chatted, my idyllic day took a turn for the worse – the peace was shattered. A couple of shikaras arrived with a total of ten new guests, a group of Indian friends. Two were to sleep on our houseboat, and four each on the boats on either side. For some reason, not at all clear to me or to Majid, they all decided to congregate on our boat. Perhaps it was because ours was the middle boat. Without so much as a nod in my direction, they simply took over the front deck and the lounge room and made me feel like I might as well be a fly on the wall. The chatter and laughter was loud – happy, yes – but they certainly made no effort to include me in any way whatsoever. I retreated to our bedroom. With no good book to read, no internet connection and no human interaction possible, the time went by very slowly. If I was to be on my own during the day, this was just not going to work. I would have to move and leave the houseboat to the others. I thought it would be best to move to the Srinagar LaLit Hotel where at least I’d be land based with a garden to walk in. When David came back from his long day out in the countryside, he’d already decided that a move was our best option and had made arrangements with the hotel. 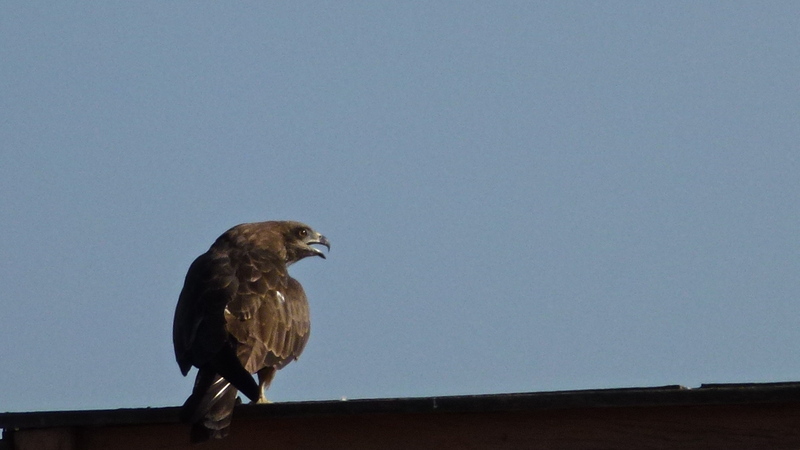 I was sorry to leave the houseboat and Majid but not the least bit sorry to leave the noisy new visitors. We went to the peace and quiet of the Lalit Hotel – and had a very good night’s sleep!